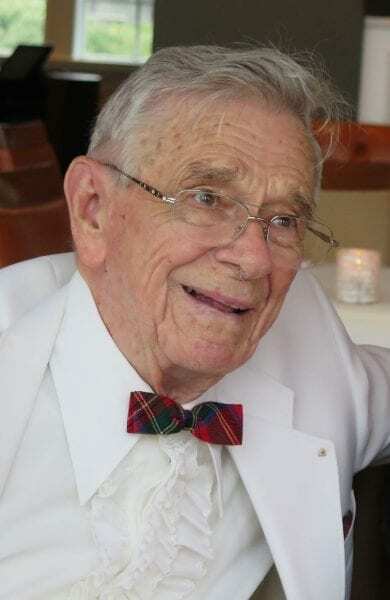 William Bruce Aitkenhead, 94, of Palm Harbor, FL died Saturday, January 19, 2019, at his home in Southern Shores, NC. A native of Holyoke, MA, he was born March 15, 1924, to the late Jessie Duff Mill and William B. Aitkenhead. Graduating from Holyoke High School in 1943, he was a gifted athlete, excelling in basketball, soccer and ice hockey. He continued his education at Waltham Watch Company Watchmaker School, graduating in 1945 as a Certified Watchmaker. He owned and operated his own watchmaking business for 10 years, later retiring after 29 years as the locksmith department head at Mount Holyoke College in South Hadley, MA. His gifted athleticism continued as an avid golfer, scoring a hole-in-one three times after the age of 70. In keeping with his Scottish heritage, Bill played the tenor drum and later the bass drum for 30 years in the Holyoke Caledonian Pipe Band, the oldest continuous Scottish pipe band in North America. He was a good artist, loved to garden and he could fix almost anything. William is survived by two sons, William Bruce Aitkenhead III (Patricia) of Southern Shores, NC and David A. Aitkenhead (Nydia) of Houston, TX; three grandchildren, Scot Aitkenhead (Michele), Lori Aitkenhead, and David Moreau (Katherine); and five great-grandchildren, Sloane, Jase and Logan Aitkenhead, Evan and Arelle Moreau; along with thirty-two nieces, nephews, great-nieces/nephews, and great-great nieces/nephews. Along with his parents, he was preceded in death by his loving wife of more than 70 years, Mary Katherine Roj Aitkenhead; and his sister, Jessie Aitkenhead Mefford of Palm Harbor, FL. Left to cherish his memory are his beloved sister-in-law Mary Roj, his brother-in-law Arthur Mefford, his loving niece Donna Mefford Mercer and his former daughter-in-law Judith Aitkenhead. Bill’s family wishes to extend a special thanks to Trish Robbins for her love, kindness and countless hours of excellent care given to dad over these last several months, and to Dare County Hospice for their care and support. A Mass of the Resurrection will be celebrated at 1:00 pm on Friday, February 1, 2019, at Holy Redeemer by the Sea Catholic Church by Rev. Dr. William F. Walsh, osfs. The family will receive friends and relatives Thursday evening from 6:00 until 8:00 pm at Twiford Colony Chapel, Manteo.